Non-enveloped, round, T=1 icosahedral symmetry, 21-22 nm in diameter. 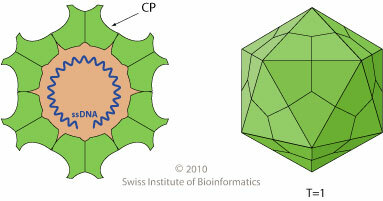 The capsid consists of 60 copies of CP protein VP1. Linear, ssDNA genome of about 6kb in size, with long inverted terminal repeats (550 nt). Equal amount of positive and negative strands are encapsidated, although the percentage of particles encapsidating the positive strand can be lower depending on the host cell. ORFs for the structural and non-structural proteins are located on both DNA strands. Host proteins transcribe the genomes into mRNAs. Alternative mRNAs splicing and leaky scanning allow expression of NS and VP products. The structural and non-structural transcripts overlap for 60 nt at the 3? ends (antisense RNAs). VP1 capsid protein displays phospholipase A2 activity. ETYMOLOGY Denso: from Latin thick, compact. Densovirus infection (by AThDNV) induces apoptosis and caspases activation . TRANSMISSION Probably via contamination of the environment by infected insects that excrete the virus.